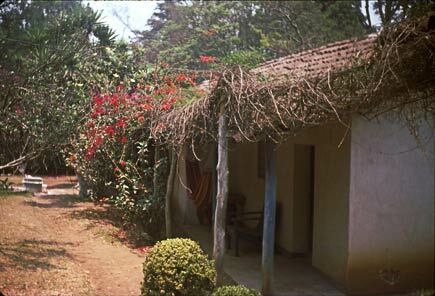 Many years ago we lived in this little house in Mixco, on the outskirts of Guatemala City. The house was near the police checkpoint at the edge of town, where the road to Antigua (as I recollect you got there along Avenida Roosevelt) began to leave the broad Guate valley and wind up the bucolic hills toward the old capital. The area was largely rural — we would watch lizards sunning themselves on the fence outside our kitchen window; on the other side of the fence cattle grazed. Down a dirt road was a little cantina. Today there is a broad freeway to Antigua. It bypasses this area, which has all been swallowed up by the grim urban sprawl that characterizes the city today. Habia una estacioncita de policia donde la calle sube hasta la antigua. La casita se localiza cerca de alla. El propietario se llamaba Hector Cruz. Favor de perdóneme el castellano mal escrito. Great place to find information !! from what year and location you took that awsome pic. The photo was taken in 1974 when I was teaching at the Colegio Americano. The property was near the police checkpoint on the old road to Antigua; the property was owned by a man named Hactor Cruz. Ey es un bonita foto, poro hubieras puesto mas, yo soy de Mixco tambien y aunque tengo muchos an’os en USA se donde estas hablando es cerca de la entrada a el Satelite no es cierto, de cualquier manera donde vivis? yo resido en San Diego CA. la tomaste antes del terremoto so aun exisate?